Eviction is a mandatory part of rental business but a majority of landlords don’t really understand what eviction means. In simple words, it means to legally expel an existing tenant from your rental unit or property. Here the term Legally has been deliberately added to enhance the significance of evicting tenants in a legally acceptable manner. Usually, landlords think that by changing the locks of their rental unit they can prevent tenants from entering and thus, perform eviction. This is called self-help eviction and it is a very damaging approach. Although it seems like the easiest way to quickly evict tenants but this kind of eviction is illegal. You might get into big trouble if you try to evict the tenant by changing locks or shutting off utilities like gas, water or electricity supply. Don’t take matters into your hands and follow the right process. In most counties across the US, the standard eviction process includes sending lease termination notice to the tenant and if he/she fails to abide by, consulting the local eviction court and attending the hearings. Termination notice is generally considered the first step. You need to inform your tenant about your decision of terminating the lease or agreement. If you want to terminate a fixed-term lease before it expires, you need to have a valid reason to do so. The cause must justify the decision of eviction. Conversely, month-to-month agreements are easier to be terminated. If your tenant is not paying rent then you have every right to evict. A majority of courts and judges usually give the verdict in favour of the landlord if tenant has stopped paying rent. However, if the tenant proves that the landlord has failed to provide habitable accommodation then non-payment of rent will be considered justified. If the tenant has violated any clause of the lease then landlord is allowed to terminate the lease between 3 to 30 days. Violation involves a number of aspects such as the tenant is having pets at a property where pets are not allowed; tenant is inviting unapproved guests or occupants for extended period without permission of landlord, subletting without landlord’s approval, noise complaints or using the property for commercial purposes without consent or permission of landlord. Despite the fact that a majority of tenants do not cause intentional damage to the property, landlord has the right to evict tenants based upon this issue. If you feel that the tenants are careless and your property will constantly be receiving wear and tear due to their attitude, it is your right to evict them. For instance, selling or making drugs is not legally allowed and if tenant is found to be involved in any such activity then the law allows landlords to evict him/her immediately. When a crime is committed by a resident, the local law enforcement would definitely take notice and deal with the person according to the law. Therefore, it is better to avoid trouble by evicting tenants performing illegal activities using your property. The laws are so strict in most of the states regarding illegal activities by tenants that landlords can send a 24-hour eviction period notice or even less. In case of natural expiry of the lease and tenant refusing to move out, landlord can get the tenant evicted. In this regard, it is important to send a legal termination notice and if the problem persists, landlord can go to the court and file an eviction action case against the tenant. 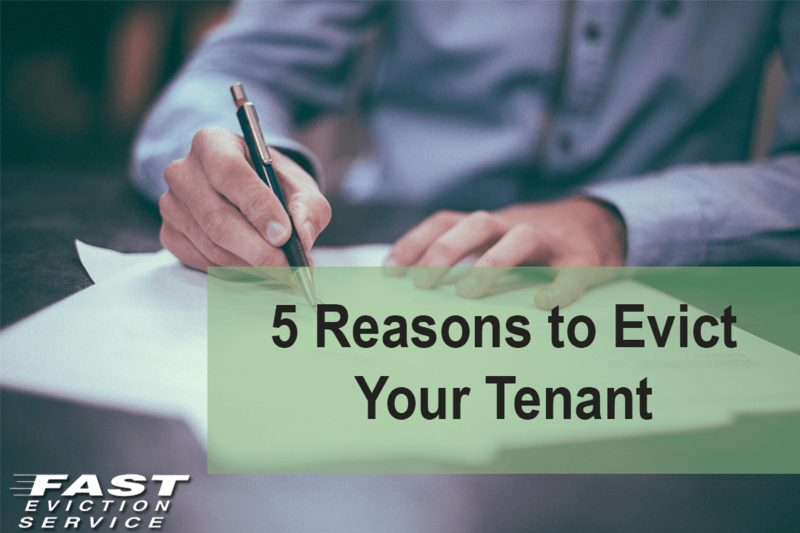 These are the top five reasons due to which landlords can evict their tenants. However, in this regard following the law is highly important. If the tenant does not pay heed to the termination notice, file a case and let the judge decide.